GM1 gangliosidosis is an autosomal recessive disorder of GM1 metabolism, resulting in variable neural and visceral accumulations. Three forms can be distinguished: infantile or type 1 GM1 gangliosidosis, juvenile or type 2 GM1 gangliosidosis, and adult, chronic or type 3 GM1 gangliosidosis. Type 1 infantile GM1 gangliosidosis presents at or soon after birth, signs being poor sucking and feeding. The child is hypotonic and hypoactive and soon develops facial and peripheral edema. At times neonatal ascites and hydrocele are seen, and sometimes generalized edema. There are characteristic coarse facial features similar to those found in mu-copolysaccharidoses. Facial abnormalities include frontal bossing,wide and depressed nasal bridge,long philtrum, and large low-set ears. The gums and tongue may appear hypertrophied. The cornea is clear. Hepatomegaly is present, and the spleen is often also enlarged. The dysmorphic features and he-patosplenomegaly gave this disease its other name: pseudo-Hurler disease. The skin is usually thick and rough. Exceptional cases of angiokeratoma corporis diffusum have been described. Failure to thrive and severe psychomotor retardation are early signs of the disease. Bilateral, cherry-red spots are found on the maculae in about half the patients. Early blindness occurs, which is cortical or retinal in origin. The child remains hypoactive and is weak. Noise frequently provokes an exaggerated startle response. Movements are poorly coordinated. Reflexes are hyperactive. 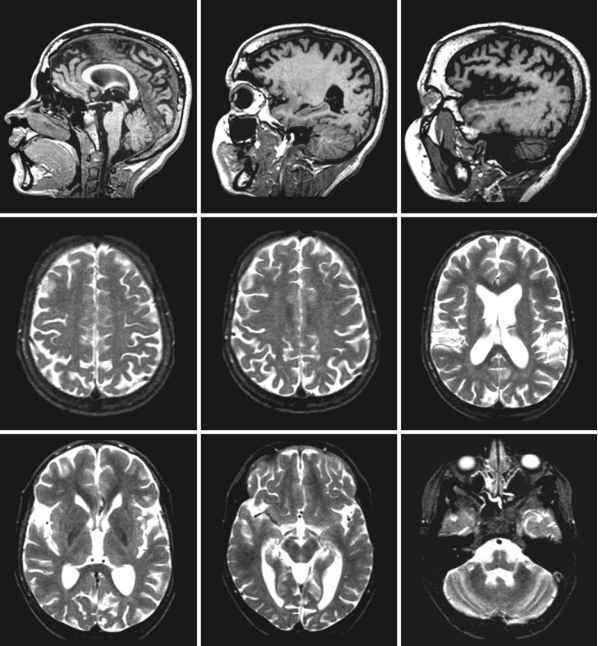 Macrocephaly can develop, but is less marked than in Tay-Sachs disease. As the child gets older, broadness of the hands and shortness of the fingers become apparent. Joints become stiff. The wrist and ankle joints are often enlarged, but not tender. Flexion contractures frequently occur at elbows and knees. Kyphoscoliosis is frequently found. After a year, neurological deterioration is rapid, with epileptic seizures, progressive spasticity, and finally decere-brate rigidity, deafness, blindness, and loss of social contact. In rare cases cardiomyopathy with cardiac failure occurs. Flexion contractures of the arms and legs may become extremely severe. Respiratory problems are common, with frequent infections. Bron-chopneumonia is a frequent cause of death, which usually occurs between 12 and 24 months. In type 2 GM1 gangliosidosis the clinical course is slower and the onset insidious. The children initially appear normal. The first clinical signs begin between 6 months (late-infantile form) and 2 years (juvenile form) of age. They usually consist of developmental arrest and gait disturbances. The subsequent course is characterized by progressive dementia, lethargy, epilepsy, an abnormally pronounced startle response to noise, spastic tetraplegia, cerebellar ataxia, loss of speech, and extrapyramidal features, such as choreoathetosis. Blindness is also a feature, but starts late in the course. No retinal degeneration or cherry-red spots are seen. The patients are not characterized by organomegaly or coarsening of facial features suggestive of mucopolysaccharidosis. Skeletal deformities are relatively mild. The average life span varies between 3 and 10 years. Death is usually caused by recurrent bronchopneumonia. Type 3 GM1 gangliosidosis is the adult or chronic variant. The clinical signs usually emerge in the second decade of life, but onset in the first decade has also been described. Gait disturbance and speech disturbance are early signs of the disease. Extrapyramidal features are usually most prominent and can take the form of slowly progressive dystonia, choreoathetotic movements, facial grimacing, ble-pharospasm, dysarthria, rigidity, parkinsonism with immobile face, bradykinesia, and typical gait abnormalities. In rare cases ataxia, pyramidal signs, mild intellectual impairment, and seizures occur. Bony abnormalities are minimal,if present. Cherry-red spots, visceromegaly, and facial dysmorphism do not occur. In type 1 GM1 gangliosidosis vacuolated lymphocytes are found in the peripheral blood smear, but these are not present in types 2 and 3. Large, foamy sea-blue histiocytes are present in the bone marrow in type 1; these cells are fewer in number in types 2 and 3. Rectal biopsy shows neuronal lipidosis in Meissner's plexus. Ultrastructurally, membranous cytoplasmic bodies similar to those seen in GM2 gan-gliosidosis are seen within neurons. The membranous cytoplasmic bodies consist of spirally wound lamellae enclosed within a membrane of lysosomal origin. Other inclusions are more pleiomorphic in nature. Evidence of neuronal lipidosis on rectal biopsy can be found in all types of GM1 gangliosido-sis. Clear vacuoles can also be found in visceral histi-ocytes and parenchymal cells of visceral organs and in epithelial cells in all types, but are less abundant in the later onset forms. Radiological abnormalities in type 1 may be minimal at birth but become progressively more pronounced with time. By 6 months there is usually little difficulty in identifying them. The abnormalities include kyphoscoliosis and hypoplasia and beaking of one or more vertebrae. The long bones are wide in the center, tapering to both ends. There is generalized rarefaction of the cortex of most bones. With increasing age the externally thickened cortical wall is removed by expansion of the medullary cavity. The metacarpals are wedge-shaped, being expanded distally and constricted proximally. The sella turcica is shoe shaped, shallow, and elongated. In type 2, radiological changes are mild and involve mainly the vertebral bodies. In type 3 the radiological changes are minimal or absent. Flattening of vertebral bodies may be seen. In types 1 and 2 the EEG shows progressive deterioration, but epileptic discharges are rare. The ERG remains normal. Biochemical investigations disclose abnormal urinary oligosaccharide excretion. The concentration of the urinary oligosaccharides appears to correlate with the severity of the disease, the excretion being highest in type 1 and lowest in type 3 GM1 gangliosi-dosis. The CSF protein is normal. In types 1 and 2 an increased concentration of GM1 ganglioside may be found in plasma and CSF. Demonstration of a deficiency of p-galactosidase activity in leukocytes or cultured fibroblasts is the most effective means of establishing the diagnosis. It is important also to analyze neuraminidase activity in order to exclude galactosialidosis. A decreased hydrolysis rate of GM1 ganglioside can be demonstrated in cultured skin fibroblasts. DNA analysis for diagnostic purposes is possible. Prenatal diagnosis is possible by enzyme analysis in cultured amniotic fluid cells or chorionic villi or by DNA analysis. 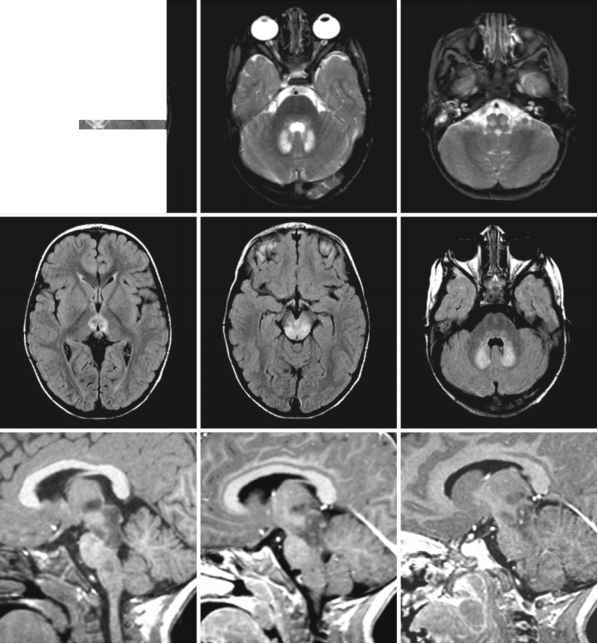 External examination of the brain in type 1 GM1 gangliosidosis usually reveals no abnormalities, though sometimes some cortical atrophy is detected. The consistency of the white matter may be increased. Light microscopy reveals neuronal storage throughout the nervous system, mainly in cerebral and cere-bellar cortex, but also in basal ganglia, brain stem, spinal cord, and Meissner's plexus. The neurons have ballooning, foamy cytoplasm, and the nucleus is displaced to the periphery. Accumulation of storage material in proximal nerve cell processes results in the formation of meganeurites and megadendrites. There is degeneration and loss of neurons. Storage bodies are also present in glia. Electron microscopy demonstrates that the neuronal inclusion bodies are identical to the membranous cytoplasmic bodies seen in GM2 gangliosidosis. They consist of spirally wound membranous lamellae enclosed within a limiting membrane of lysosomal origin. The white matter in type 1 GM1 gangliosidosis is gliotic, and there is a diffuse and profound paucity of myelin. Axons are relatively preserved. Where present, myelin is structurally normal, but the thickness of most myelin sheaths is reduced. The early myeli-nating structures have a myelin content that is normal for age, whereas the myelin content of later myelinat-ing structures is much lower than expected. Oligo-dendrocytes are decreased in number, and apoptosis of these cells can be observed. The white matter abnormalities are probably the result of a combination of disturbed myelination and myelin loss. In type 1 GM1 gangliosidosis visceral storage is found. The liver is enlarged, and storage material is present in hepatocytes and in histiocytes in liver sinusoids. The renal glomerular epithelium shows marked vacuolization of the cytoplasm. The spleen, lymph nodes, thymus, and intestinal mucosa contain many foamy histiocytes. Large foamy histiocytes are present in bone marrow aspirates. Skin biopsies show foamy vacuolization of sweat gland epithelium, histi-ocytes, fibroblasts, and endothelium cells. The vacuoles appear empty. The stored oligosaccharides in visceral organs are extremely soluble in water and are lost on fixation. In types 2 and 3 GM1 gangliosidosis identical neuronal storage is seen. In type 3 the neuronal storage is present predominantly in the basal ganglia. White matter is either not affected at all, or only to a minimal extent. The visceral storage varies considerably. There may be no storage at all, or sparse histiocytes may be seen in spleen and liver. There may be foam cells in bone marrow and lymphatic tissue, and vac-uolization of hepatic and renal cells similar in form to but less severe than in type 1. 70-90% of total ganglioside, instead of the normal about 25 %. The level of total lipid in gray matter is slightly decreased, mainly due to a moderate decrease of phospholipids and glycolipids. In white matter a marked decrease of major myelin constituents is found, such as cholesterol, phospholipids, cerebro-sides, sulfatides, and proteolipid protein. 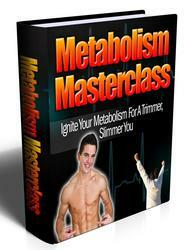 Marked increases in free fatty acids and in cholesterol esters are found in most cases. The white matter chemical abnormalities are compatible with moderately severe myelin destruction. In the myelin membrane itself the concentration of GMi ganglioside is also several times the normal concentration. Other abnormalities in the composition of isolated myelin are a very high concentration of cholesterol, a low level of glycolipids, especially cerebroside, and a low concentration of phospholipids, especially ethanolamine phospho-lipids. These myelin abnormalities represent the transitional state of myelin undergoing nonspecific breakdown. The neuronal inclusion bodies, the so-called membranous cytoplasmic bodies, have an extremely high ganglioside content. GM1 accounts for approximately 95% of the total ganglioside content. Other components are proteolipid protein, phospholipids, and cerebroside. One of the glycolipids, cerebroside, consists mainly of glucocerebroside, which is an unusual cerebral constituent after the infantile period. There is a 20- to 50-fold accumulation of GM1 ganglioside in liver and spleen. Furthermore, there is visceral accumulation of galactose-containing oligosac-charides, which by far exceeds the accumulation of gangliosides. Some oligosaccharide fractions contain sialic acid. The oligosaccharide accumulation rather than the ganglioside storage is the chief cause of the visceral histiocytic vacuolation. Storage of galactose-containing, partially degraded, derivatives of keratan sulfate has been demonstrated in liver and brain. In type 2 GM1 gangliosidosis the concentration of GM1 ganglioside and its asialo derivative are moderately elevated in the brain, to a considerably lesser degree than in type 1 GM1 gangliosidosis. The myelin lipids, such as cholesterol, phospholipids, sulfatide, and cerebroside, are much closer to normal than in type 1 GM1 gangliosidosis. Visceral accumulation of oligosaccharides is less marked. In type 3 GM1 gangliosidosis the accumulation of GM1 ganglioside in the brain is more focal. Accumulation is most marked in the putamen and caudate nucleus, where GM1 accounts for 50% or more of all gangliosides, whereas GM1 accounts for about 30% of all gangliosides in the white matter and only a slight increase, if any, in the proportion of GM1 ganglioside is noted in the cerebral cortex. Abnormal accumulation of asialo GM1 is only noted in the basal ganglia. There are no abnormalities in the concentrations of other lipids, such as cholesterol, phospholipids, and glycolipids. Visceral accumulation of oligosaccharides is minor. GM1 gangliosidosis is caused by a deficiency of the lysosomal degradative enzyme acid p-galactosidase. This enzyme is an acid hydrolase catalyzing cleavage of terminal p-linked galactose from a variety of substrates, including GM1 ganglioside, its asialo derivative GA1, lactosylceramide, galactose-containing oligosaccharides, and the mucopolysaccharide ker-atan sulfate. The gene coding for p-galactosidase, GLB1, is located on chromosome 3p21.33. Activity of p-galactosidase is also dependent on a functional protein, called protective protein/cathepsin A. This protein is encoded by PPGB, a gene located on chromosome 20q13.1. Protective protein associates with two enzymes, p-galactosidase and neuraminidase, in an early biosynthetic compartment, and by virtue of the association the two enzymes are correctly routed to the lysosome and protected against rapid breakdown by intralysosomal proteases. Some hydrolytic enzymes need nonenzymic factors (activator proteins) for degradation of sphingolipids in the lyso-some. Substrates cleaved by p-galactosidase differ in their requirement of such activator proteins. Sphin-golipid activator protein 1 (called SAP-B or saposin B) is required for the cleavage of GM1 ganglioside by P-galactosidase. SAP-B acts on GM1 as a kind of solu-bilizer. SAP-B shares a common larger precursor protein, called prosaposin, with some other SAPs. Pro-saposin is encoded by a gene on chromosome 10q22.1, PSAP. SAP-B not only activates p-galactosi-dase to cleave GM1 ganglioside, but also activates the cleavage of sulfatide by arylsulfatase A and globo-triaosylceramide by a-galactosidase. Two diseases have been recognized for deficiency of p-galactosidase: GM1 gangliosidosis, a neuro-degenerative disorder with visceral involvement, and mucopolysaccharidosis type IV B, also called Morquio B disease, a generalized bone disease. Molecular analysis has confirmed allelic mutations of the same gene in these two diseases with diverse pheno-typic expressions. It has been suggested that this multiplicity of phenotypes can be explained by different alterations in the catalytic activity of the mutant enzyme, which differentially alters its activity on a variety of substrates. There is evidence that patients with Morquio disease type B retain a higher catalytic activity for GM1 ganglioside than for oligosaccharides and mucopolysaccharides. The phenotypic variability in clinical symptomatology of GM1 gangliosidosis may be explained in the same way. The early infantile form is characterized by neurological dysfunction in combination with bony abnormalities and visceral storage. In later onset forms, progressive neurological symptoms are present but visceral and bony abnormalities are minimal or absent. Differences in residual enzyme activity, different types of mutations affecting different catalytic functions of the enzyme, different rates of turnover of the enzyme and substrates in brain, viscera, and bone may be responsible for these phenotypic variations. An attractive hypothesis is that in some cases the mutant enzyme possesses about the same low residual activity for each natural substrate (infantile type), whereas the mutant enzyme possesses significantly different residual activities for different natural substrates in other cases (juvenile and adult types). Apart from GMi gangliosidosis and Morquio disease type B, p-galactosidase deficiency occurs in a number of disorders caused by different gene mutations: variant forms of metachromatic leukodystrophy, galactosialidosis, and I cell disease. Deficiency of the protective protein caused by a protective protein gene mutation leads to galactosialidosis. Deficiency of the protective protein gives rise to a secondary deficiency of both p-galactosidase and neuraminidase activity. SAP-B deficiency results in a form of metachromatic leukodystrophy, with a variable concomitant accumulation of gangliosides and other glycosphingolipids in addition to sulfatide storage. In I-cell disease, or mucolipidosis III, deficiency of P-galactosidase is caused by a defect in posttrans-lational processing of the enzyme molecule. In GM1 gangliosidosis, GM1 ganglioside and its asialo derivative accumulate in lysosomes owing to the impairment of normal degradation. GM1 is a normal component of cellular membranes, and its content is especially high in neuronal plasma membranes, particularly in the regions of nerve endings and dendrites. GM1 gangliosides act as binding molecules for toxins and hormones and are involved in cell differentiation and cell-cell interaction. They stimulate neurite outgrowth and enhance the action of nerve growth factor. In GM1 gangliosidosis accumulation occurs predominantly in neurons, resulting in neuronal dysfunction and eventually neuronal cell death. There are several factors,which may contribute to neuronal dysfunction and death. The accumulated GM1 ganglioside and its asialo derivative are relatively insoluble in water and aggregate within lamellated membranous bodies in lysosomes. Expanding lyso-somes with increasing amounts of stored products may disturb intracellular transport, in this way disturbing cellular metabolism. Leakage of toxic in-tralysosomal products of enzymes into the cytoplasm during the process of intralysosomal storage may cause damage. Accumulation of GM1 ganglioside in the neuronal membrane results in alterations of membrane structure. Gangliosides contain long,satu-rated fatty acids, which increase the packing density of the membrane and reduce its fluidity. GM1 ganglio-side, specifically, has a pronounced effect on the reduction in membrane fluidity as the carbohydrate moieties of GM1 reduce the rotational freedom within the hydrophobic regions of the membrane. The increased cholesterol content also contributes to the reduction of membrane fluidity. The altered membrane fluidity may influence the synaptic transmission and the activity of membrane-bound enzymes. GM1 gangliosidosis is also characterized by inappropriate proliferation of secondary neurites and aberrant formation of synapses. This abnormal sprouting may lead to changes in neuronal connectivity, resulting in specific functional impairment. Evidence has been found for neurotransmitter dysfunction with disturbed neurotransmitter release and re-uptake and for specific dysfunction of cholinergic and GABAergic neurons. The later onset forms of GM1 gangliosidosis have more focal neuronal pathology, which is especially marked in basal ganglia and the spinal cord, whereas in the infantile form there is more generalized neuronal pathology, which is especially pronounced in cerebral and cerebellar cortex. We can only speculate on the explanation for this phenomenon. The regulation of substrate and enzyme synthesis and turnover may not be identical in different types of cells and may not be the same at all ages, which would change the distribution of cells in which saturation of the residual enzyme occurs earliest and is most prominent. Significant white matter changes are only present in type 1 GM1 gangliosidosis. There is a severe myelin deficiency,which is caused mainly by a disturbance of myelinogenesis with seriously delayed and arrested myelination. Myelin deposition occurs in close collaboration between axons, oligodendrocytes, and astrocytes. Altered neuronal/axonal membrane properties and disturbed oligodendroglial-axonal communication may be at the basis of the disturbed myelination process. Disturbances of oligoden-droglial maturation and myelin production and early oligodendroglial cell death through apoptosis are contributing factors. However, there is also a component of myelin loss. The myelin loss may be secondary to degeneration of neurons as well as primary owing to oligodendroglial cell death, altered myelin composition, and myelin instability. Galactose-containing oligosaccharides accumulate in the viscera,particularly in type 1 GM1 gangliosido-sis. These oligosaccharides are derived from the incomplete degradation of glycoproteins in lysosomes. The accumulation of these water-soluble compounds is responsible for the cytoplasmic vacuolation of visceral cells, the foamy histiocytosis in bone marrow, and the vacuoles in circulating lymphocytes. Storage of galactose-containing, partially degraded deriva tives of keratan sulfate occurs in liver, spleen, brain, and bone, especially in type 1. Storage of these compounds in bones is responsible for the bony deformities. At present there is no effective treatment for GM1 gangliosidosis. Hematopoietic stem cell transplantation can be attempted, especially in the later onset forms, but insufficient data are as yet available to assess its potential. In addition, there is evidence in animal experiments that the low molecular compound 1-deoxygalactonojirimycin may increase p-galactosidase activity. The compound passes through the blood-brain barrier. Human studies are in progress. Gene therapy is still at the level of experimental research. In type 1 GM1 gangliosidosis CT of the brain typically shows a slightly increased density of the thalamus (Fig. 9.1). MRI shows diffuse white matter abnormal-ities,partly but not only explained by severely delayed and disturbed myelination. The signal abnormalities are more pronounced than would be expected if they were due merely to delayed myelination (Fig. 9.1). White matter gliosis and some myelin destruction add to the signal changes. We observed a very subtle pattern of radiating lines with a more normal signal intensity within a patient's abnormal cerebral white matter, which we found to be related to a higher myelin content in perivascular regions. The brain stem, and sometimes the posterior part of the corpus callosum, are better myelinated, but the cerebellar white matter can be myelin deficient (Fig. 9.1). The basal ganglia and thalamus display subtle signal changes on MRI,with a slightly increased or decreased signal intensity of the thalamus and a slightly increased signal intensity of the basal ganglia on T2-weighted images and a variably increased signal intensity of the thalamus on Trweighted images (Fig. 9.1 , upper row). The pattern closely resembles the imaging findings in early-onset GM2 gangliosidosis. In type 2 GM1 gangliosidosis, progressive atrophy of the cerebral hemispheres has been described with enlargement of the ventricular system and subarach-noid space and atrophy of the cerebellum and brain stem (Fig. 9.2). There are subtle white matter signal abnormalities, which are commonly seen in neuronal degenerative disorders and are secondary to loss of neurons and axons and their myelin sheaths (Fig. 9.2). The CT images that have been published suggest that the density of the thalamus and basal ganglia might possibly be mildly increased. In type 3 GMi gangliosidosis, elevated T2 signal and atrophy may be found bilaterally in the caudate nucleus and putamen. Hypointensity of the globus pallidus on T2-weighted images has also been reported. In addition, cerebral atrophy and slight white matter signal changes secondary to neuronal degeneration can be found. 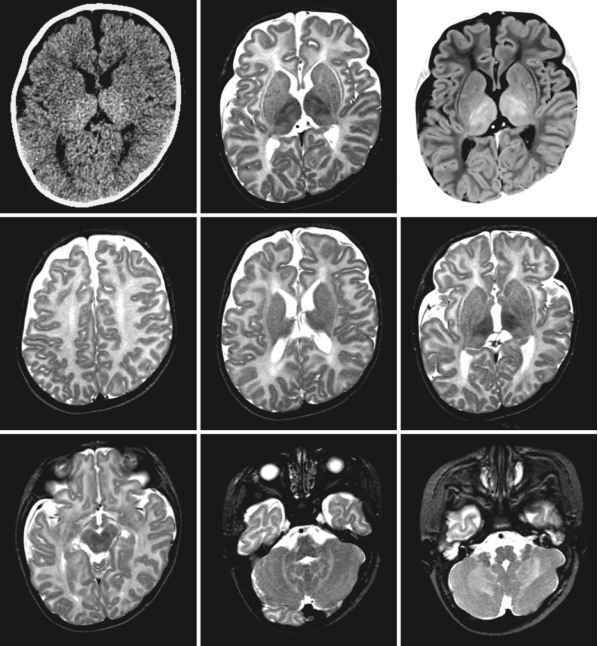 The images are identical to those of adult GM2 gangliosidosis. Fig. 9.1. CT scan and MR images in a 7-month-old boy with type 1 GM1 gangliosidosis. Note the high density of the thalamus on CT.The thalamus and basal ganglia are diffusely slightly abnormal on both T1- and T2-weighted MR images (first row).